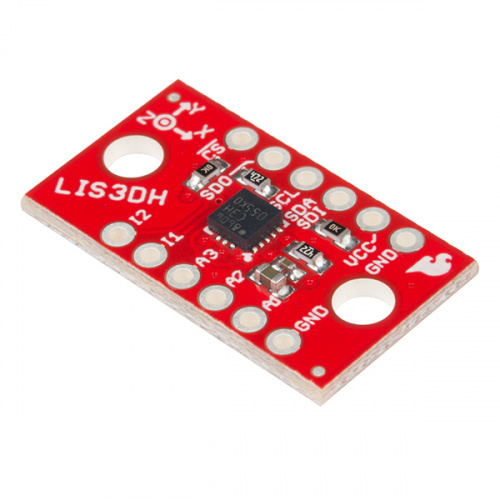 The LIS3DH is a triple axis accelerometer you can use to add translation detection to your project. The "3D" in LIS3DH refers to the fact that it is a 3DoF, or 3 Degrees of Freedom. Additionally, it has a few analog inputs to play with, and it has some built in movement detection features to detect things like free-fall, and to indicate if the FIFO buffers are full. If you're looking for something small and inexpensive, and are only measuring acceleration, this is the product for you. Other inertial measurement units (or IMUs), such as the LSM9DS1; the LSM6DS3; or the LSM303C, can provide additional space location data such as gyroscopic or magnetometric. 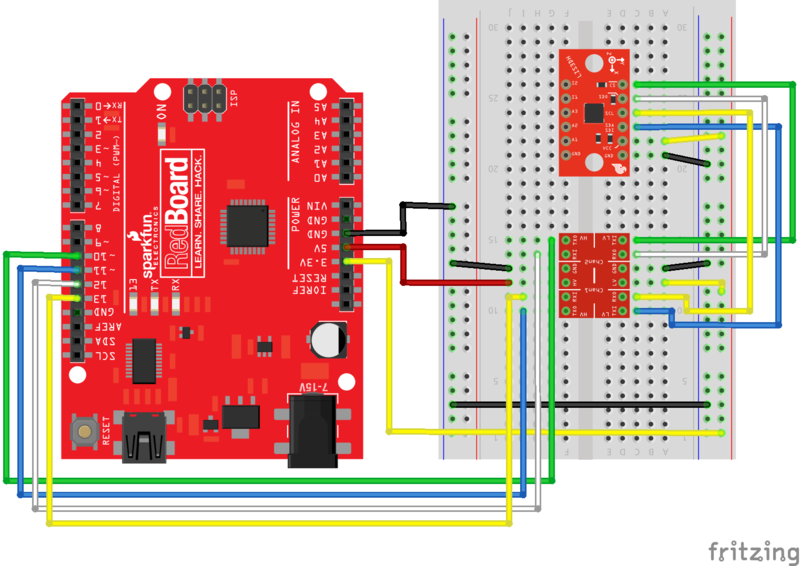 This guide presents the basics of plugging the board into a RedBoard, shows how to use the Arduino library to get acceleration data live or by FIFO collection, and describes the library usage. Straight Male Headers -- Or wire. Something to connect between the breakout and a breadboard. 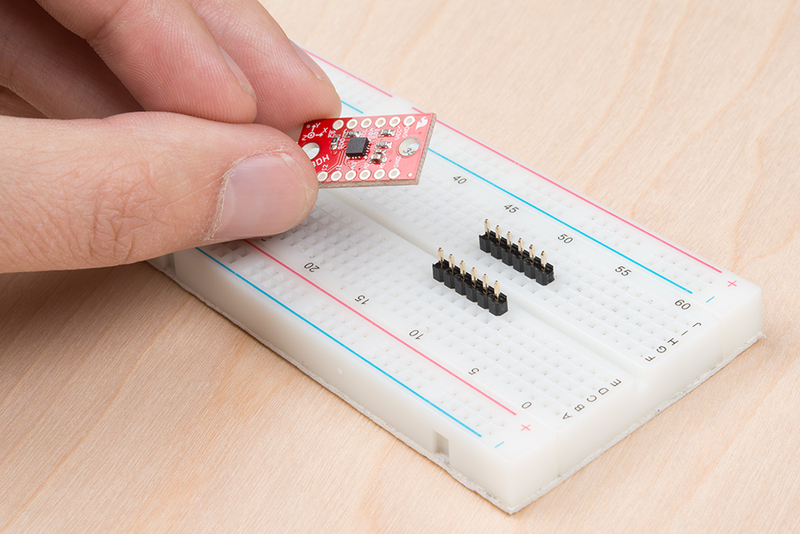 Breadboard -- Any size (even mini) should do. M/M Jumper Wires -- To connect between Arduino and breadboard. The LIS3DH is a 3.3V device! Supplying voltages greater than ~3.6V can permanently damage the IC. As long as your Arduino has a 3.3V supply output, and you're OK with using I2C; you shouldn't need any extra level shifting. But, if you want to use SPI, you may need a level shifter. A logic level shifter is required for any 5V-operating Arduino (UNO, RedBoard, Leonardo, etc). 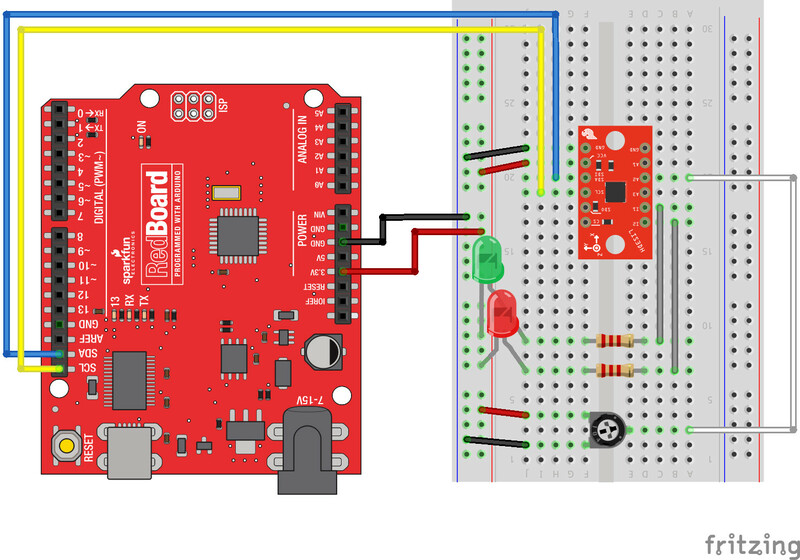 If you use a 3.3V-based 'duino -- like the Arduino Pro 3.3V or 3.3V Pro Mini -- there is no need for level shifting. LIS3DH_Datasheet -- Hardware information and register map. LIS3DH_AppNote -- Descriptive material showing basic usage. There are a few different methods with which you can use the LIS3DH. The top side of the board has the LIS3DH sensor, some bypass caps and pull-up resistors. This table gives more information as to each pins functionality. The serial port can be connected as either SPI or I2C, and it uses the same physical pins for both. To get going, just wire up your choice of interface, supply 3.3v, and ground. Note that you will not need to use all the pins no matter which communication method you choose. On the bottom, there are two jumpers that correspond to the I2C address and pull-up enable. The I2C Address Jumper -- Bridge to use alternate address 0x18, otherwise leave open for 0x19. Leave open for SPI use. 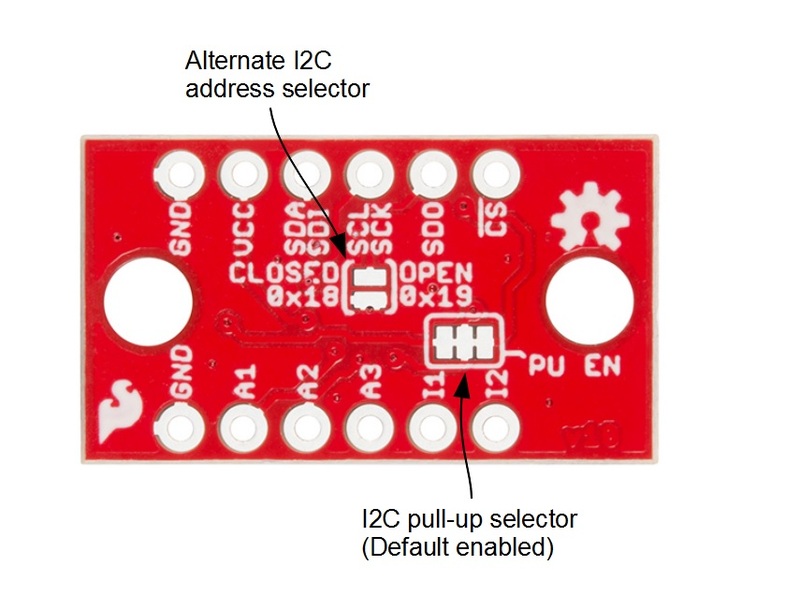 The I2C Pull-up Enable -- Closed by default, this connects a pull-up resistor between the I2C lines and VCC. This generally doesn't interfere with SPI operation, but, if less power consumption is required, carefully cut the copper traces. This sensor works nicely with a breadboard for easy connection, and, because it gives some mass to the accelerometer, it more closely matches what might be expected from a project or cellphone. 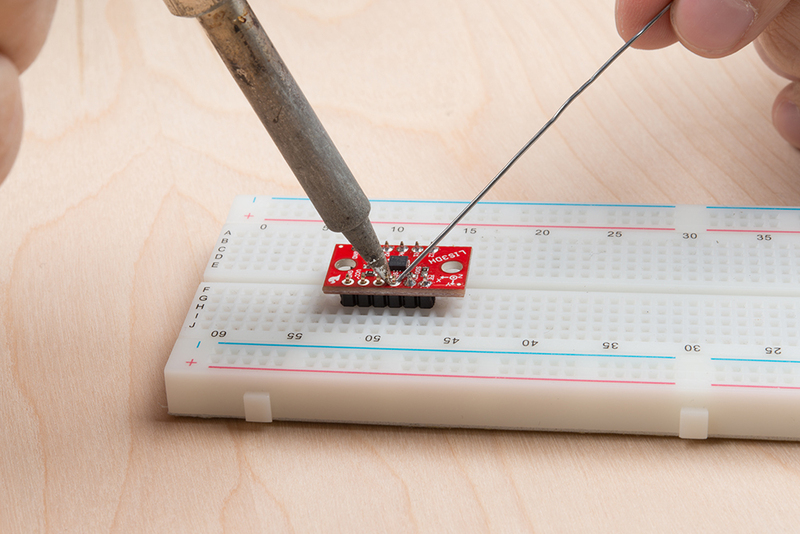 To add headers, break off two 6-pin lengths of 0.1 inch male headers, and set them into a breadboard to use as a soldering jig. Two rows of headers placed and ready to solder. Drop the breakout board onto the pins, and solder down the rows. Soldering on the rows of pins. Congratulations! You're now ready to connect the sensor to a microcontroller of your choosing. 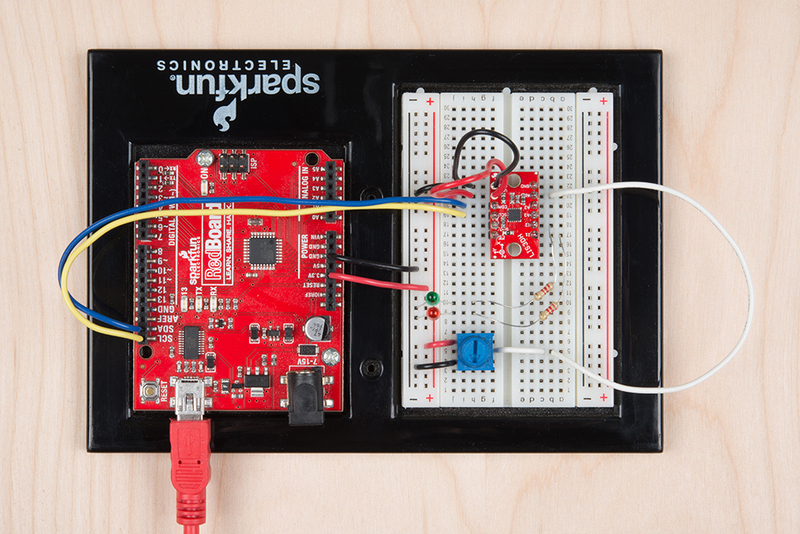 The examples in the guide use the Arduino IDE and a RedBoard to communicate with the LIS3DH. To get the Arduino library, download from Github, or use the Arduino Library Manager. For help installing the library, check out our How To Install An Arduino Library tutorial. If you don't end up using the manger, you'll need to move the SparkFun_LIS3DH_Arduino_Library folder into a libraries folder within your Arduino sketchbook. 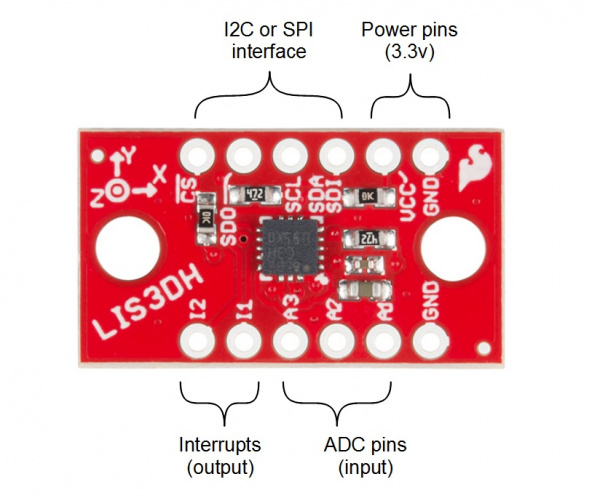 The first circuit allows a RedBoard to talk to the LIS3DH over I2C and provides connections on the interrupt and ADC pins. The interrupts are useful to indicate conditions like extreme Gs or freefall, and to tell the RedBoard that the FIFO is full and needs to be serviced. The analog input pins are useful to measure various voltages similar to the RedBoard's analog inputs, but have a more constrained voltage range (about 0.9V to 1.8V). If you don't need either of these, just connect power, ground, and communication pins, and ignore the interrupt and ADC examples. Use these two pictures as a guide for building the circuit. 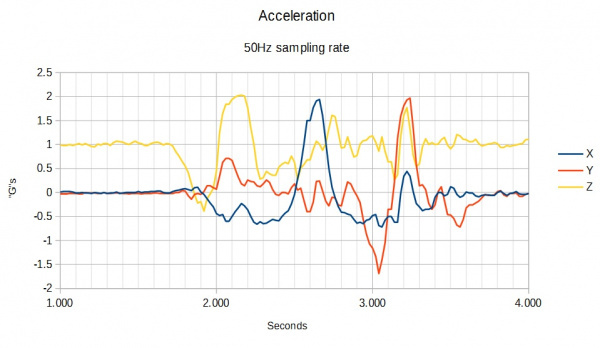 Start with just the basic accelerometer sketch, also called "MinimalistExample" from the library. This will periodically samples the sensor and displays data as number of Gs detected. Remember, the vertical axis will read 1G while sitting at rest. LIS3DH myIMU; //Default constructor is I2C, addr 0x19. When run, the sketch will display data in Gs to the serial terminal. Every second, the data is collected and printed. To try out the analog inputs, load the example called "ADCUsage", or copy paste from the following section. This example also shows some of the additional settings that can be applied within the begin() function. The sketch prints the three ADC values every 300ms. Move the knob to see how the values change and how the effective voltage range is somewhat in the middle of the full range. Move the wire from on ADC pin to another to see that the controlled value changes. Interrupt behavior is highly configurable and is thus omitted as basic library functions. Instead, LIS3DH registers are directly written in accordance with the datasheet. An example is provided that has the relevant registers configured with comments in a template function that can be copied into a project and modified. Run the example named IntUsage, which will throw an interrupt on one pin when an exceeded acceleration is detected and a pulse on the other when a tap is detected. The second method in which to communicate with the LIS3DH is with the SPI interface. The SPI interface operates at 3.3v, so use a logic level converter or a MCU that operates at 3.3V. Use the following pictures to help build the circuit. SPI is not the default configuration, so you'll have to pass extra information to the library by constructing with parameters. Modify "MinimalistExample" by changing LIS3DH myIMU; to LIS3DH myIMU(SPI_MODE, 10); for SPI mode with the !CS pin connected to pin 10. 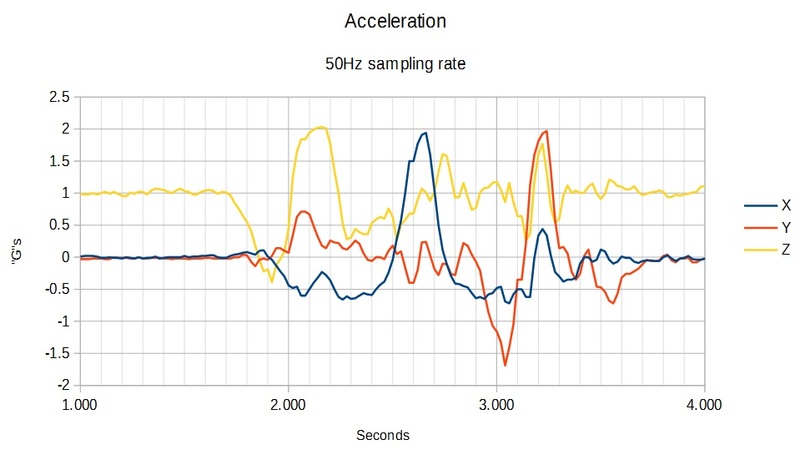 The SPI bus can operate faster than I2C, so for high speed data collections where periodic sampling is required, SPI is advisable. This graph was made by taking the output of the example and copy-pasting it into a spreadsheet program, then creating a chart. During the data collection, the sensor was moved about a foot back and forth on each axis. //1 degree C per unit of ADC3 data. myIMU.settings.fifoMode = 1;  //FIFO mode. //Now loop until FIFO is empty. //bits (b5 to b0) instead. Configuring FIFO with no error checking...Done! Notice that the output produces batches of data periodically. Even though the data waits to be collected, it is still sampled periodically. The data is collected when the FIFO is past the watermark configured in the line myIMU.settings.fifoThreshold = 20;. LIS3DH myIMU; //This creates an instance the library object. The main LIS3DH class has a public member, which is named settings. To configure settings, use the format myIMU.settings.accelSampleRate = (...);. Then, call .begin() to apply. Advanced programmers: The LIS3DH class inherits the LIS3DHCore, which can be used to communicate without all these functions, so you can write your own. This class is not covered in this hookup guide. Call after providing settings to start the wire or SPI library as indicated by construction and runs applySettings(). Returns 0 for success. This configures the IMU's registers based on the contents of .settings. These functions return axis acceleration information as a 16 bit, signed integer. These functions call the Raw functions, then apply math to convert to a float expressing acceleration in number of Gs. These functions return the ADC values read from the pins. Values will be 10 bit and the detectable range is about 0.9V to 1.8V. Note: When tempEnabled == 1, ADC3 reads as an unreferenced temperature in degrees C. Read twice and calculate the change in temperature. This enables the FIFO by writing the proper values into the FIFO control reg, and control reg 5. This does not start the data collection to the FIFO, run fifoStartRec() when ready. Sample rate depends on data rate selected in .settings. This reads all data until the status says none is available, discarding the data. Use to start with new data if the FIFO fills with old data. This enables FIFO data collection. Run this before starting to check if data is available. After fifoStartRec is used, data from the X, Y, Z registers is not real time, but is the next available sample. This stops the FIFO and returns the device to regular operation. LIS3DH Breakout Github repo -- Design files. SparkFun LIS3DH Arduino Library Github Repo -- arduino library. LIS3DH Datasheet -- Hardware information and register map. LIS3DH AppNote -- Descriptive material showing basic usage. Need a little inspiration? 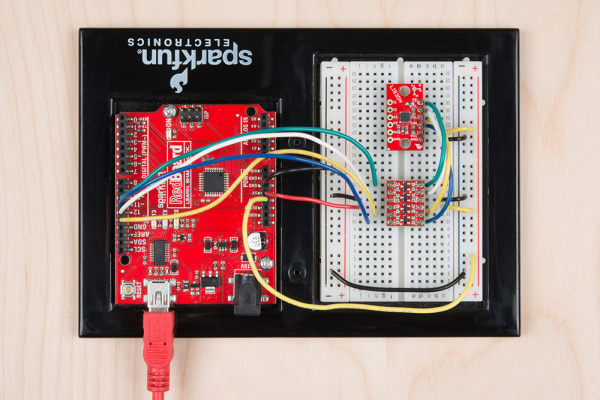 Check out some of these other great SparkFun tutorials.